The transformation of natural environments impacts the needs of species. Gartersnakes that have taken up residence on agricultural land, for example, may need a little help to get through the winter. And this is where the Nature Conservancy of Canada (NCC) comes in. In the vicinity of Saint-Georges-de-Clarenceville in Montérégie, NCC is protecting an agricultural lot in collaboration with the Ministère des Forêts, de la Faune et des Parcs (MFFP) and several teams of professionals, to make it a site with high ecological value. The common gartersnake, a non-venomous snake about 60 centimetres long, is found on this property. In winter, it needs a safe shelter where the temperature remains above freezing. 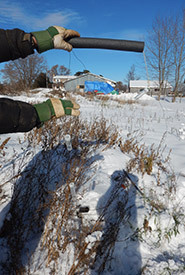 “In a non-wilderness context, snakes may take refuge in barns or houses if there is no intervention,” explains Valérie René, biologist and project manager for the region. “Our role is therefore to provide them with a habitat more conducive to their survival,” she continues. An underground refuge, called a hibernaculum, was installed in the field. It is a two-metre deep hole, packed with stones and logs and covered with earth, with just a small opening for the snakes to enter. It has to be deep enough so that the bottom of the hibernaculum does not freeze, even during the coldest part of the winter. In fact, to make sure of this Valérie has installed probes: one at the bottom of the hole, another in the middle and a third at the surface. Throughout winter, data will be recorded and then collected in the spring. This type of intervention is part of a wildlife management approach in an agricultural environment. This is the first time in Quebec that NCC has implemented such a system. 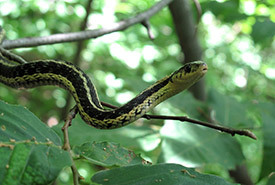 “Snakes are generally unloved, but gartersnakes do us a lot of good, especially by getting rid of certain pests, such as small rodents,” explains Valérie René. "That is why taking care of them is important for the good of the overall ecosystem in the area."